Mt. 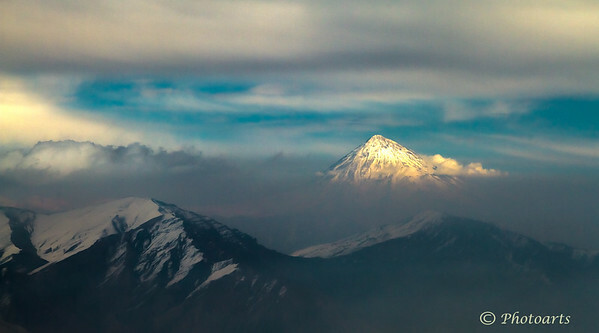 Damavand at over 18400 ft. (5610 m) located in Northern Iran reaches out of the late evening clouds and mist to catch the last rays of setting sun over the Alborz mountain range. It is the highest peak in all of middle east and highest volcano in all of Asia. That is truly a spectacular view !! Love the sunlit peak !! Wonderful shot !! Amazing shot of this peak, which before now I'd never heard of (shame on me and my ignorance). Superb light on the tip of this mountain.